I was going to try and eat primarily fruit and veggies today but it is hard to stick to raw when it is cold and you feel below par. I felt much less bloated after yesterday’s fruit fest and slept well last night. However, my skin was quite bad today and I am now wondering whether I should cut out citrus too. Two people told me that they have spots and very dry skin when they consume oranges or lemons. I have been consuming a lot this year as I have been adding lemon peel to chilled water, starting the day with lemon in hot water and eating lots of oranges and blood oranges. So I stuck to apples (3!!! 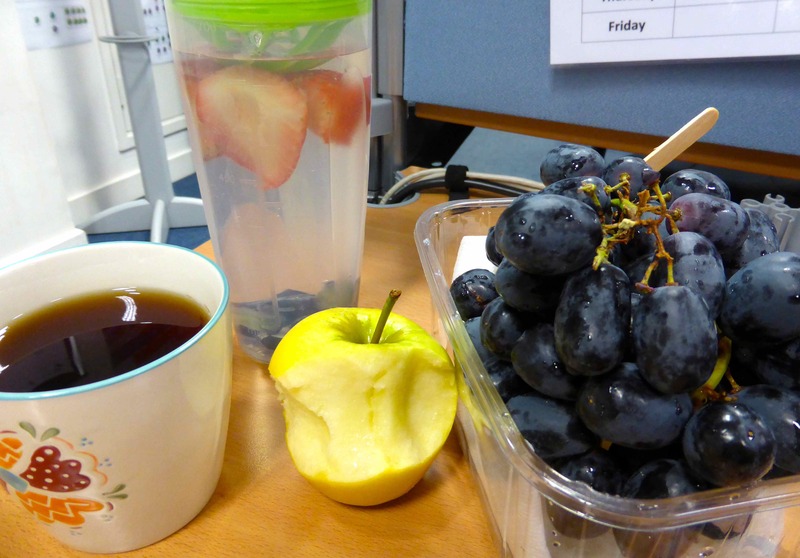 ), grapes and black tea this morning plus I sipped on chilled water infused with strawberries and grapes. 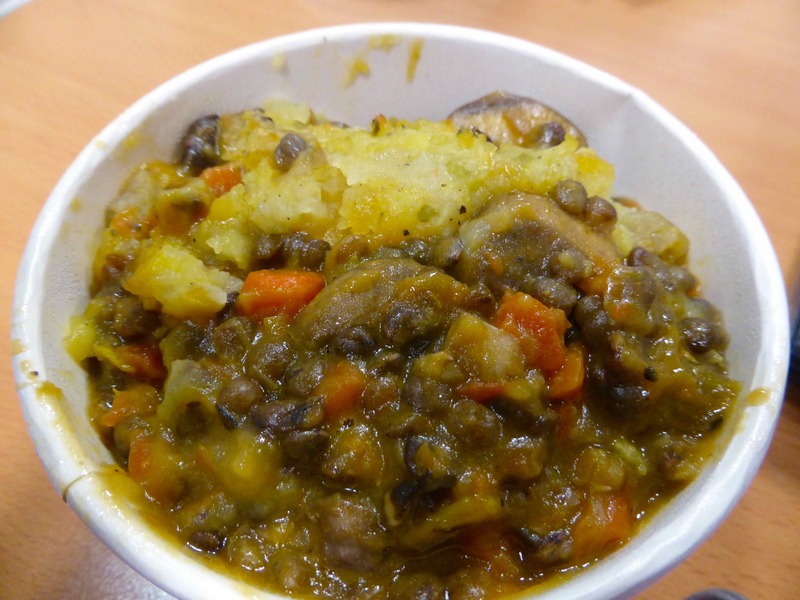 I went over to Food For Thought at lunch time, a vegetarian restaurant on Neal Street. They mark which recipes are vegan and most of them are – whoop whoop. Great to have such a choice. This shepherdess pie was AWESOME. I loved every morsel and could have eaten twice as much. I will be going back for more of that. It was vegan but I think even a meat lover would have enjoyed that as it was so full of flavour. I am meant to be avoiding the lattes but this afternoon I fancied something sweet so I had a soy milk latte and a bag of popcorn. Still vegan and not as bad as it could have been but definitely best avoided when trying to lose weight. 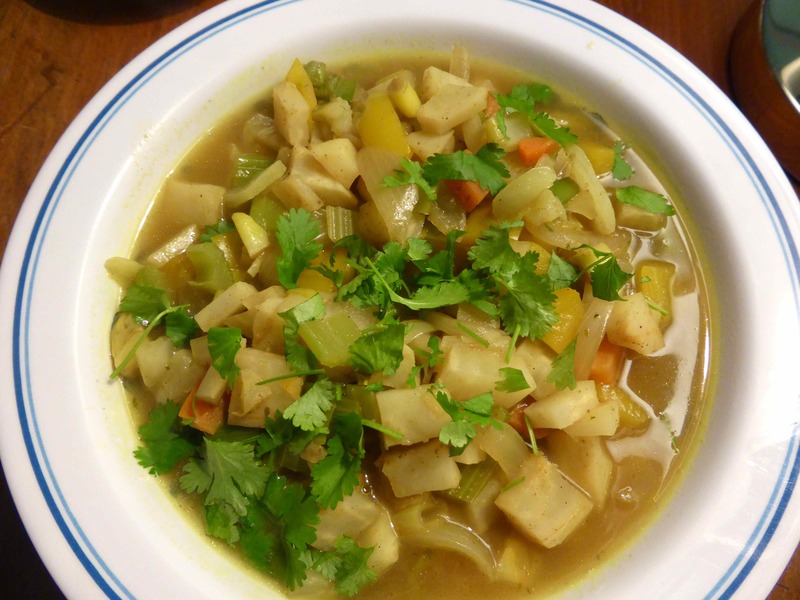 I made the simplest ever veggie stew for supper. 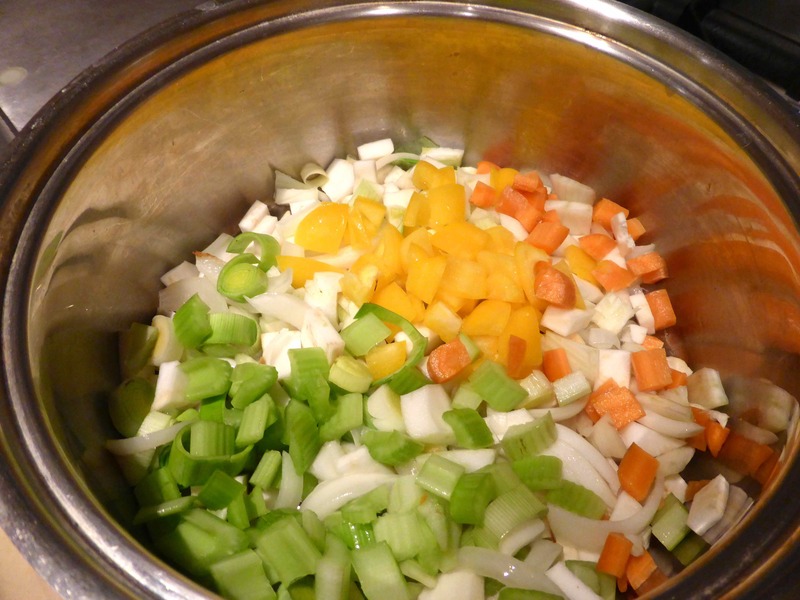 I lightly fried in coconut oil some onion, celery, yellow pepper, celeriac, fennel, carrots and leeks. 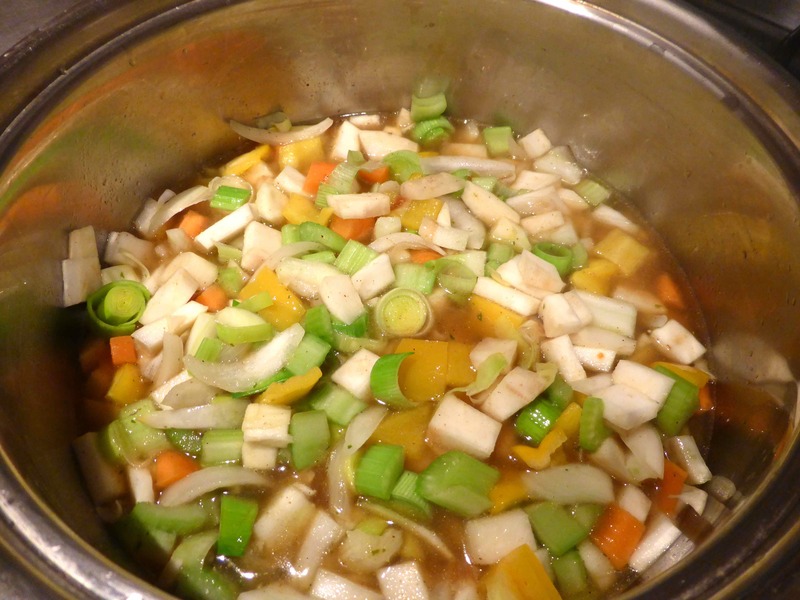 Then I added some vegetable stock and a small amount of garam masala, put the lid on and simmered gently for 15-20 minutes. Then I tipped it all in to a large bowl and topped it with coriander. Simple, quick to make, vegan and full of goodies. We like that! 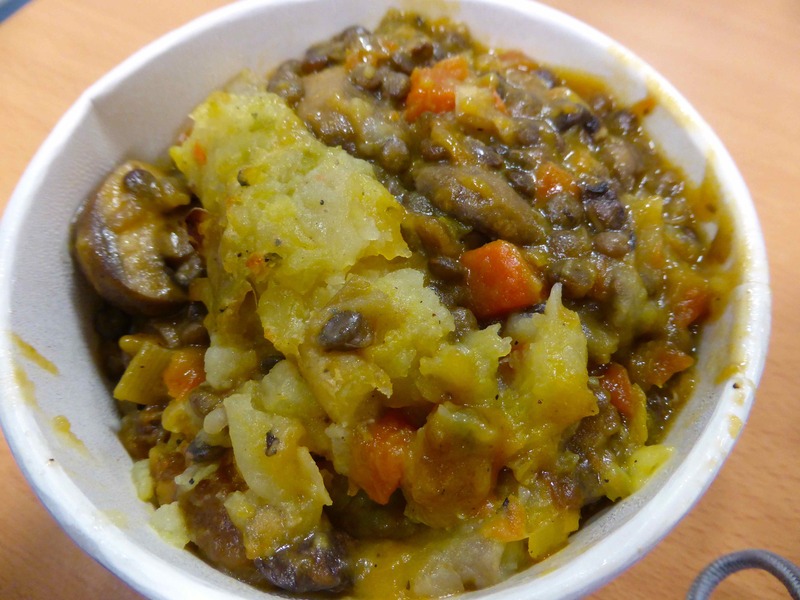 This entry was posted in Uncategorized and tagged Lentils, Vegetables, veggies. Bookmark the permalink.